The HSS1332AT and HSS1132ATD are powerful machines, but like any piece of equipment, they only work well when they’re maintained. Here’s everything you need to know to take care of basic maintenance tasks on these Honda snow blowers. – Check the scraper and shoes, adjusting as needed. – Change the engine oil. – Check the spark plug. – Check the track tension. – Have your snow blower serviced professionally. This includes cable adjustment and auger transmission maintenance. – Drain fuel system and clean carburetor sediment cup. The HSS1332ATD comes equipped with an electric starter powered by a battery. This battery is stored in a box directly behind the gas tank. To open the box, pull down on the rubber strap to release it from the pin, then tilt the top of the box top up and forward. Check the output of the battery with a multimeter. If it reads below 12.9 volts, the battery needs to be recharged. Honda recommends limiting current to two amps. Charging should take between 5 and 10 hours. When removing the battery, disconnect the smaller negative terminal first, followed by the positive terminal. Next, push down on the battery strap to unhook it from the base. Reinstall in reverse order. The starter is protected by a 5 amp fuse, located in a cover next to the battery. The GX390 engine that powers these blowers is designed to use 5W-30 oil for gasoline engines. When draining the oil, use a wrench to keep the drain extension in place while you unscrew the drain bolt. To get an accurate measurement, check the oil with the blower on a flat surface and do not screw in the oil filler cap/dipstick. When filling, the oil should reach the edge of the filler neck. – On the sliding part of the levers, between the lever and the mount. The drive chains for the tracks should be lubricated with Hondalube graphite or moly chain lube, or an equivalent high-quality lubricant. The gap between the electrodes should be between 0.028 and 0.031 inches. Some wear is normal, but the plug will need to be replaced sooner than recommended if the insulator or electrodes are damaged. When installing the plug, turn it until you feel it seat. If the plug was used previously, turn it an additional 90 degrees. If you’re installing a new plug, turn it 180 degrees to crush the sealing washer. You can also use a torque wrench, tightening both used and new plugs to 13 ft-lbs. To check the tension, place 11 lbs. of weight on the top center of the track. With this weight in place, the track should move 7/16 to 5/8ths of an inch. To change the tension, find the adjusters on the bottom rear of the machine. These look like studs with two nuts threaded onto them. Loosening the outer nut will let you turn the inner nut to adjust the tension. Once the track deflection is within specifications, tighten the outer nut to 16 ft-lbs. The skid shoes have two friction surfaces. Once one side wears out, the shoe can be unbolted and flipped upside down to use the other surface. Replace the scraper blade if it’s less than 1/16 of an inch thick. 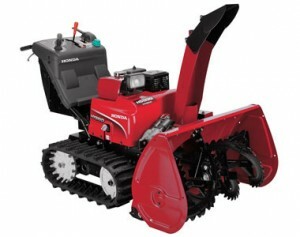 Honda Lawn Parts sells parts for everything from Honda’s Power Equipment line including snow blowers. If you need something for your HSS1332, check out our snowblower parts & accessories section, or enter your model and serial number to see parts for your machine. Our site has factory information including exploded diagrams and descriptions built in, making it easy to find exactly what you’re looking for. We ship across both America and Canada. To order, visit www.hondalawnparts.com. 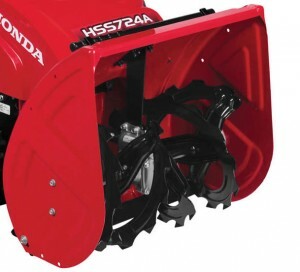 Are you having problems with your Honda HSS928 snow blower? Is it due for some preventative maintenance, or needs to be readied for storage. 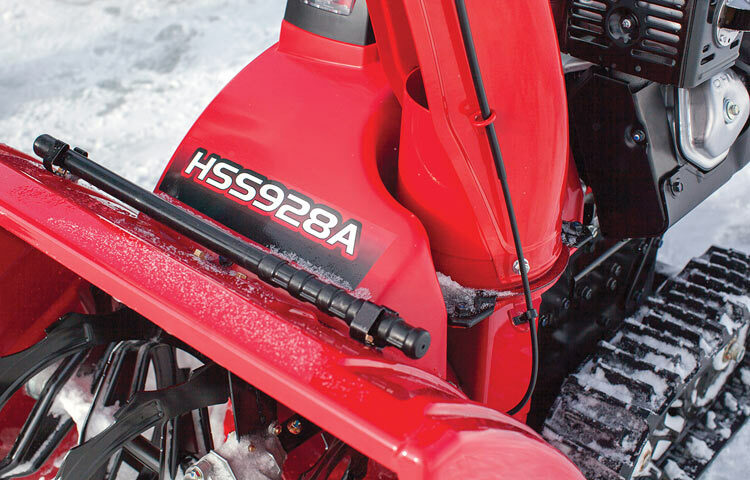 This is everything you need to know to keep your HSS928AW or HSS928AWD clearing snow. Before putting your blower to work: Check the level of the auger shoes and scraper. Inspect the auger and blower shear bolts. Check the engine oil level. Every 100 hours: Change the oil. Every 300 hours or four years: Replace the spark plug. When getting your blower out of storage: Change the oil, adjust the spark plug gap, adjust the track tension (if equipped) and charge the battery on AWD blowers. Before putting up the blower at the end of the season: Check the tires (if equipped,) drain the fuel system, lubricate the drive chains (track models only,) check the chute control cable. To keep your machine in top condition, Honda recommends professional service after 20 hours or one month of use, before the start of the season, every 300 hours, every 1,000 hours and every four years. These services will handle adjustments and repairs that are too difficult for most owners, including cable adjustments, idle adjustment, and fuel system cleaning. To get oil past the frame, the 928 comes with an extension installed in the engine drain hole. To drain the oil, use a 17 mm wrench to keep the extension in place and loosen the drain plug with a 10 mm wrench. Use a new drain plug sealing washer when changing the oil. Honda recommends using 5W30 motor oil that meets the API’s SJ service category or later. When fully drained, the engine should hold about 1.2 quarts of oil, which is enough for the level to reach the edge of the dipstick cap hole. The plug gap should be anywhere from 0.7 to 0.8 mm, or 0.028 to 0.031 inches. When installing, tighten the plug to 13 lb-ft, or tighten it until it seats, then turn it another ¼ turn for a used plug or ½ turn for a new plug. With 11 lb-ft. of force on the top middle of the track, the track should move 11-16 mm or 7/16-5/8 inches. The tensioner can be moved by turning the adjusting nut. It’s threaded onto a stud sticking out of the rear frame member. Loosen the lock nut on top of to this nut, then turn the adjuster nut until the track deflection is within spec. Tighten the lock nut to 16 lb-ft. The tires are designed to perform best at 20 psi. Replace the tires if they’re cracked, damaged or have worn down treads. The shear bolts will break under pressure, protecting the drivetrain if an object jams the auger or impeller. Shut off the engine and disconnect the spark plug before replacing broken bolts. The auger and impeller have sharp edges, so you should wear heavy gloves when working around them. Start by using the cleanout tool, attached to the back of the auger housing, to clear out snow buildup and dislodge debris. If the auger or impeller is bent, stop using your snow blower and have it looked at by a dealer. Once everything is freed up, install the new shear bolts. The auger is split into two pieces, each connecting to the transmission with a single bolt. Slide the bolt through the side of the hole closest to the transmission, then thread on and tighten the nut. The impeller attaches to the transmission using a carriage bolt. This bolt goes through plates on the auger and transmission output shaft. You may need to spin the impeller to line up these two plates. Insert the bolt from the back of the plates, lining up the square end with the hole in the impeller, then screw on the nut. The shoes used on the HSS928 are double-sided, so once one side is worn down, the shoe can be flipped upside down to use the other surface. When adjusting skid shoe height, track models need to be lifted up using the height adjusting lever, then slowly lowered to the ground until the shoes make contact with the ground. 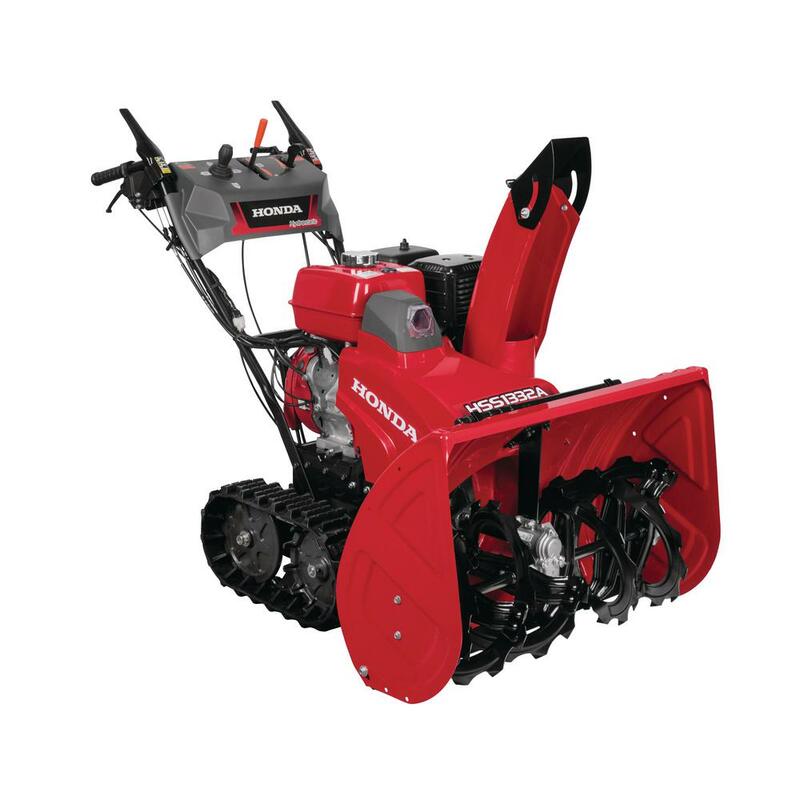 Hondalawnparts.com is an authorized dealer of Honda Engines and Power Equipment, so we carry everything you need for your two-stage snow blower including shear bolts, skid shoes, air filters. We ship across the U.S. and Canada.